Today is Memorial Day in the US. I am spending time with m family and finishing up a couple of projects I have going right now. This photo was taken at Arlington National Cemetery on Memorial Day 2010, but not by me. I have had the chance to visit this cemetery along with Fort Snelling National Cemetery in Minneapolis where my grandfather is buried, Punchbowl National Cemetery on Oahu, and Biloxi National Cemetery and Natchez National Cemetery both in Mississippi. Each time I stood in awe of all the men and women who served or gave their lives in service. 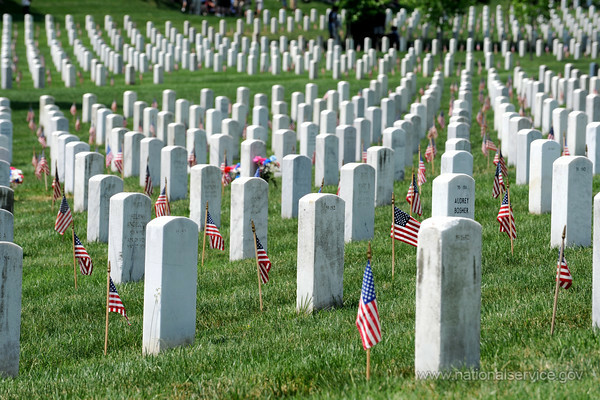 This is a day where many just celebrate being off work not even knowing the true meaning today has. Make sure your children know what today means. Spend time with your families, cook out, go camping, or just enjoy your day off work, but don't forget why we are given this day. Fellow Americans, please take a moment to remember those who have died in service to our country. To family and friends who served and made it back safely, I am thankful for your service to our country. I will be back with a book review next week. I love this post! My son got to lay the wreath on the the Tomb of the Unknown soldier at Arlington. This summer he gets to play at Pearl Harbor with his marching band!